Night parties have their own unique charms, but they can be a bit challenging. How will you create an atmosphere that will really elicit oohs and aahs from your guests – in darkness? Our friends at Homemade Home Ideas have generously shared with us a list of some of the most unique and beautiful DIY outdoor lighting ideas that will surely make your home look enchanting! The link follows after our own thoughts. Here are some of my favorite ideas: Make Your Own Outdoor Candle Lantern – Many people would use tiki torches to line their walkways. 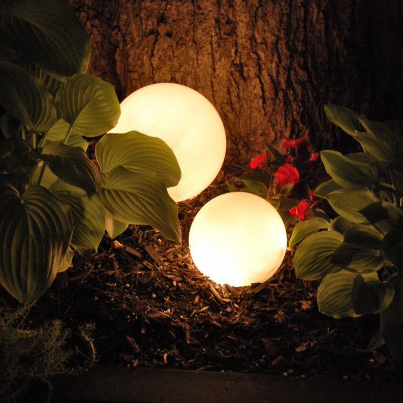 However, these outdoor candle lanterns will really make your decor look more interesting. Try to get glass hurricanes in different sizes. These will make your outdoor candles look more eye-catching and unexpected. Make Your Own Ice Lanterns – Ice lanterns leave a kind of romantic effect but they can of course only be used during the winter season when the temperatures are below freezing. Before freezing your ice lanterns, try to add a few drops of fragrance oils so that when the ice melts, the lanterns will leave a subtle scent to your home. If you live in an area where the climate is more temperate, you can make your own no-melt “ice lanterns”! Use a frosted glass and line the inner part of the glass with a few fake leaves and fruits. Insert a battery operated candle in the middle of the frosted glass. Magical Paper Lanterns – These star-shaped lanterns will make your trees look more lively. Try to use colored sheets of paper to create multi-colored paper lanterns. Make Your Own Citronella Candles – Mosquitoes are such pesky insects that will really make for a major party downer. You can make your own citronella candles by filling the wax in tin cans. You can choose to decorate the tin cans by wrapping the outer part of the cans with yarn. You can also use twine! Cup Cake Lights – If you have LED lights at home, you can use pretty paper cup liners. These are perfect for themed parties! When you look at a snowflake under a microscope, it looks so beautiful because of its unique yet symmetrical pattern. Perfect order and perfect chaos – combined! Snow is amazing stuff. Many people decorate their homes in winter by buying or making their own versions of the snowflake. Some people stick snowflake designs on their windows to make ther house resemble that of a “winter wonderland”. 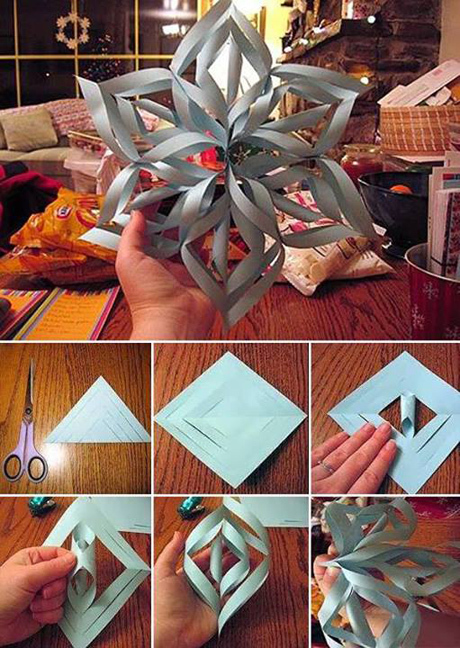 This tutorial by Wikihow will teach you how to make 3D paper snowflakes! 1. the 3D paper can get easily crushed so you can choose to use thicker paper. This may be a bit of a challenge to make but it will help make your snowflakes last longer. Use a sponge brush and dip it in Mod Podge and coat your snowflakes to give them a beautiful shine. 2. You don’t have to make these snowflakes during the winter. You can make these “snowflakes” look more star-like and appropriate for other seasons by painting them in different colors. Try dipping the tip of your brush with a few acrylic paints and use the splatter technique to add color to your snowflakes. 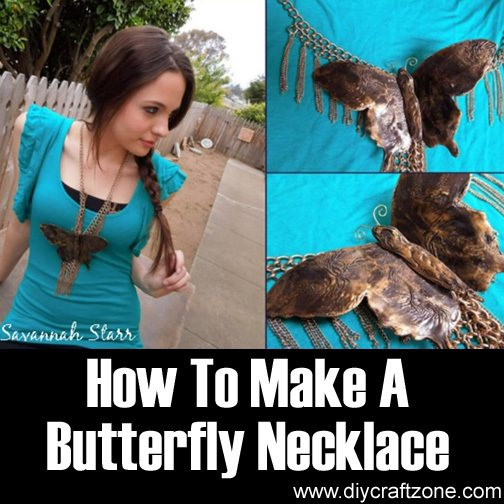 Make a few of these pieces to decorate your room. You can also add glitter to these colorful snowflakes to add more oomph to your decoration! Another idea is to wrap a few barbecue sticks with floral tape. Attach a stick at the back of the colored “snowflake”. Make a bunch of these snowflake sticks and stick them in a recycled glass bottle. 4. Make a themed corkboard and place it on your wall. During the winter stick winter themed items. Make a few of these 3D snowflakes to make your room more appropriate for the winter season! You can also stick on memorable winter pictures to remind you of the fun times that you had with your loved ones! Try to make these 3D snowflakes at home to create your own winter wonderland!